Join us on Friday March 1st at 8PM for our 3rd annual Marcharitaville Madness show! 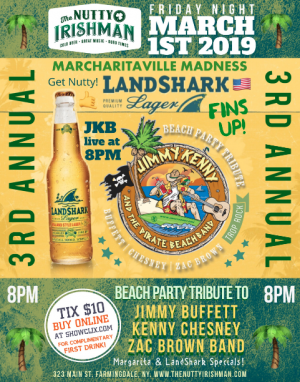 Jimmy Kenny & The Pirate Beach Band will be performing all the best music of Kenny Chesney, Zac Brown Band & Jimmy Buffet. Purchase your ticket in advance for only $10 and receive a complimentary first drink!